The only thing she stands to lose are her shoes.Cinderella is an ordinary teenage girl, with an extraordinary name. But because of that name, she and her cousins, Belle, Aurora, Ariel, and Snow White suffer years of torment from their peers. Then as the girls enter high school and the enticing world of dating, a life-altering decision must be made. Is it finally time to stop fighting, and surrender to the fairy tale clichés that have been holding them back? By embracing their names, the girls discover an inner-strength they never knew existed. And by putting everything they have on the line, maybe, just maybe they will discover there really is such a thing as 'happily ever after'. I was asked to give an honest review, so here it is. To be fair, I only listened through chapter eight because it was so poorly written I couldn't bring myself to finish the book. I had a hard time with the names of the characters...who in this modern day would name their child Snow White Princess and actually call her Snow White? It was unbelievable, a little too unrealistic for realistic fiction. The flow of this book really felt like something a junior high school student would write. I played the car-race-to-the-restaurant part for my three teen-aged daughters and one of them actually said it sounded like something her teen cousin wrote (who is always writing stories and having her read them). I like that the author wrote a clean book, we need more of those, but the story was just too juvenile even for my teens. As for the narrator, she was a little too peppy. So sorry for a poor review. I enjoyed it. The story line is unique. I liked the it was clean, without language and adult situations and innuendos. I would have preferred that the narrator use different voices for some of the characters. I’m interested in continuing the series. Reader used the same voice for each character and for every emotion - silly little girl. The mother's sounded like silly little brain dead girls no matter what hardships they experienced. The sisters sounded like silly little brain dead girls, even when sad and rejected. The boys sounded like silly little brain dead girls through the whole book. It made the book sound silly and brain dead, and written by a little girl, for silly little brain dead girls. The idea of the book was cute. The writting left a lot to be desired. A better reader might have salvaged it, but instead, took away the last possible redeemable quality. I gave two stars for performance because the little girl who was the reader successfully pronounced all the words, and read at a seventh grade level. I'm assuming she's still in middle school. Kudos sweetheart. If you could sum up The Princess Sisters in three words, what would they be? What was one of the most memorable moments of The Princess Sisters? Honestly, I loved the prologue. It just completely set the tone for everything that follows. What does Ashlyn Kindberg bring to the story that you wouldn’t experience if you just read the book? She is the perfect voice to read this story. Very energetic and engaging! I love the little details, like when teachers take attendance at school and the girls are called by last name, first name so that it comes out as "Princess, Snow White." Or how Snow White doesn't eat apples and Ariel is terrified of water. Cute story for young readers. I really loved the idea of this book. I will say that it was hard to get into at first, but after the first few chapters it picked up and was really entertaining. I loved the voice/reader (Ashlyn Kindberg) and thought she did a great job keeping me straight with all the switches in point of view. I would definitely read a sequel. The princess cousins overcoming their hangups and standing up to a bully. What about Ashlyn Kindberg’s performance did you like? I loved her excitement and the inflections she gave. She did the many changes in point of view brilliantly! She was perfect for this book. Would you listen to The Princess Sisters again? Why? I would for sure listen again because the story is great and the narration is awesome too! Love Meg Cabot? Read Stacy Lynn Carroll! 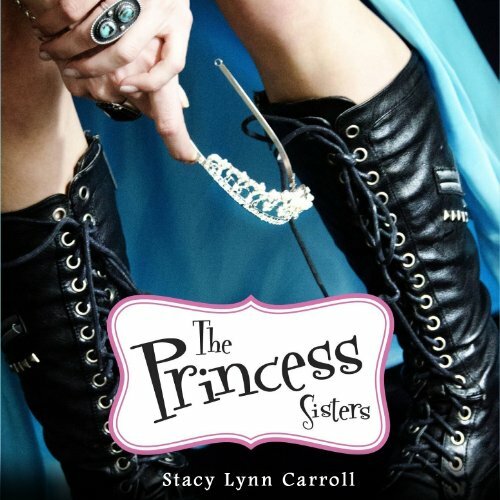 Where does The Princess Sisters rank among all the audiobooks you’ve listened to so far? This book belongs right next to winners like Meg Cabot’s ALL-AMERICAN GIRL and TEEN IDOL. It has that young feel that teen girls will connect with. I liked both Belle and Cinderella. I think it is because Carroll focused more on them throughout the book, although she does spend an equal amount of time in the heads of the other "princess sisters". I liked the voice she added. Each girl had their own unique voice. I think all books should be enjoyed with a good narrator. They can add so much more, especially when it comes to emotions being relayed or humor. Ms Kindberg does an amazing job. I hope she continues the series. Yes, and I did. Because the story moves rather quickly in the beginning it helped to connect with all the characters. Carroll did a good job not lingering too much over the unnecessary details. She gave good insights into the girl's thoughts, and I liked the moments of mystery that she added to the book. Overall I enjoyed the book and will be reading the second installment. I am a father of three girls and I think they would enjoy reading this book when they get older. Because it has references to pop culture that have become a part of the American tradition I believe this book has staying power that will last far beyond its years. What did you love best about The Princess Sisters? In the beginning this book was a little overwhelming because it had so many descriptive words but after you got through the first part its amazing. I love how the narrator got into showing emotions and using the kind of reactions you would get if watching a movie. Also the book itself has such a good plot and I love how it is about friendship and love. I liked how the cousins where so close and they were named after fairy tales. It is truly interesting how they do exactly oposite as what their characters would do. Also I love how it has the love story in it. I thought she did great at using the right emotional sounds for the character. When it was intense she was intense, when it was funny, she was funny. The princess sisters who want to find their way. As far as narration goes, The Princess Sisters was pretty good. The narrator's voice acting fit in well with the teenaged girl main characters, although at times it was a bit too peppy at inappropriate times. One of the most memorable moments of The Princess Sisters was their plan near the end. I won't spoil it for you, but I really enjoyed it! I really liked Ashlyn Kindberg's energy and enthusiasm. She really brought vitality to these characters. Five modern Princesses seeking their Prince and avoiding toads.